3rd Floor - King Bed - 2 Twin Beds - Sofa Sleeper -- You'll enjoy this roomy condo overlooking the Gulf! 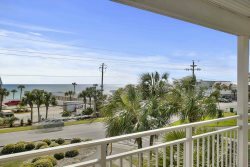 You'll enjoy vacationing in this spacious condo overlooking the Gulf. A very special feature of this condo is the original beach-scene art painted by the owner. Located near the elevator on the 3rd floor of Maravilla's most desirable beach front building #2. Free Beach Set-ups Included (2 Chairs & Umbrella). Free wireless high speed internet. Small dog pet friendly! Extensive book selection is available in this condo for reading. You will love this Destin Vacation Condo. Call us or book online today! Coastline Condos were great to work with very helpful and accommodating. The condo was awesome with great views of the beach, ocean, and pool. Great area for walking dogs, walking, and jogging. My dog loved sitting in the window and watching all the people and other dogs outside. Oh, and it was great to have the daily rental of an umbrella and 2 chairs reserved for us each day at the beach included with with our stay. The view was incredible! The condo was very clean and neat and the grounds were beautiful. My little fur baby enjoyed being with us too. The breezeways and elevators were also clean. It was a very nice stay. We will be back next year! And, the art work was great also.